“Supportive Normies” are the people in our lives who can drink normally but support our recovery. I highly recommend enlisting one or two “normies” in your life to be trusted insiders. You may be finding a lot of support in meetings or recovery groups, but as this time of year closes in on us we may find ourselves adrift in a series of family gatherings and social events with nothing but normies (and likely a smattering of active heavy drinkers). Your sponsor and supporters are likely only a text message away, but it can also be very helpful to open up to a few choice others who are part of our daily life. 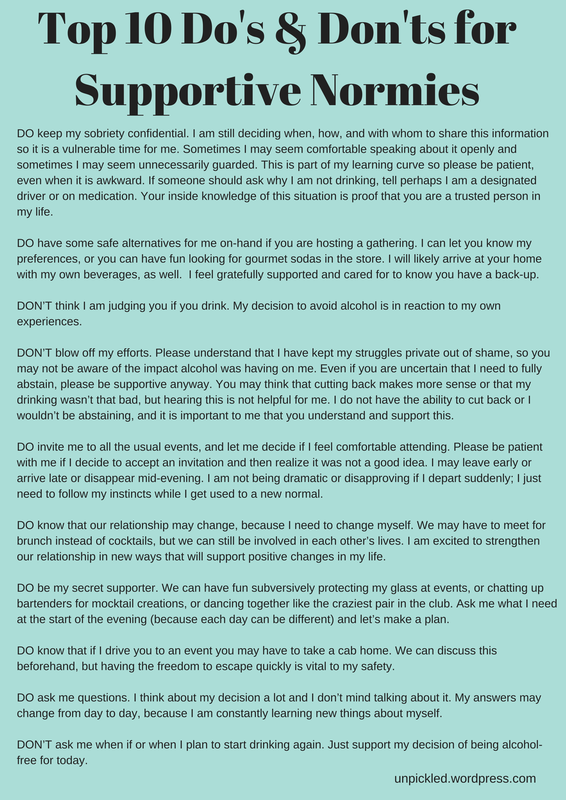 I’ve created a “Do’s and Don’ts” list that you can print for or email to your Supportive Normies. First though, think carefully about choosing your confidants. Your knee-jerk reaction may be to bee-line for the usual suspects (your sister, bestie, or spouse), but the best choices may be someone you spend less time with. If you are new to recovery, you may have surrounded yourself with drinking buddies and enablers. Certainly there could be true gems among this group, but also consider a favourite aunt, neighbour, or other person who has become peripheral in your life because they were not part of your drinking structure. Give this some quiet thought. Once you have chosen a supporter or two to confide in, you may want to share this list with them. It can be used to spark discussion or to avoid it, whichever you need at the moment. You may want to create your own version of this list, adding and omitting as needed. The main goal is to create awareness for your needs, and to help you ask for support. DO keep my sobriety confidential. I am still deciding when, how, and with whom to share this information so it is a vulnerable time for me. Sometimes I may seem comfortable speaking about it openly and sometimes I may seem unnecessarily guarded. This is part of my learning curve so please be patient, even when it is awkward. If someone should ask why I am not drinking, tell perhaps I am a designated driver or on medication. Your inside knowledge of this situation is proof that you are a trusted person in my life. DO have some safe alternatives for me on-hand if you are hosting a gathering. I can let you know my preferences, or you can have fun looking for gourmet sodas in the store. I will likely arrive at your home with my own beverages, as well. I feel gratefully supported and cared for to know you have a back-up. DON’T think I am judging you if you drink. My decision to avoid alcohol is in reaction to my own experiences. DON’T blow off my efforts. Please understand that I have kept my struggles private out of shame, so you may not be aware of the impact alcohol was having on me. Even if you are uncertain that I need to fully abstain, please be supportive anyway. You may think that cutting back makes more sense or that my drinking wasn’t that bad, but hearing this is not helpful for me. I do not have the ability to cut back or I wouldn’t be abstaining, and it is important to me that you understand and support this. DO invite me to all the usual events, and let me decide if I feel comfortable attending. Please be patient with me if I decide to accept an invitation and then realize it was not a good idea. I may leave early or arrive late or disappear mid-evening. I am not being dramatic or disapproving if I depart suddenly; I just need to follow my instincts while I get used to a new normal. DO know that our relationship may change, because I need to change myself. We may have to meet for brunch instead of cocktails, but we can still be involved in each other’s lives. I am excited to strengthen our relationship in new ways that will support positive changes in my life. DO be my secret supporter. We can have fun subversively protecting my glass at events, or chatting up bartenders for mocktail creations, or dancing together like the craziest pair in the club. Ask me what I need at the start of the evening (because each day can be different) and let’s make a plan. DO know that if I drive you to an event you may have to take a cab home. We can discuss this beforehand, but having the freedom to escape quickly is vital to my safety. DO ask me questions. I think about my decision a lot and I don’t mind talking about it. My answers may change from day to day, because I am constantly learning new things about myself. DON’T ask me when if or when I plan to start drinking again. Just support my decision of being alcohol-free for today. Vauw – Brilliant. Now running on day 41 sober I may have learned most of these the hard way. And now I can easy hand them out as basis for a rich dialog. Thank you for sharing your thoughts. 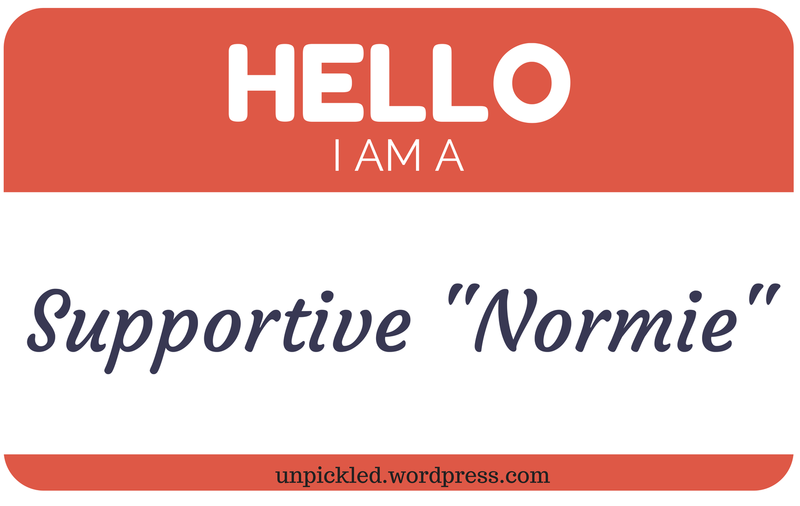 It is really important for a person who ahve suffer from any for of addiction to have support normie, even though she/he receive supports from the group she belongs in a counselling. The normie will serve his/her confider when they feel alone or they are not comfortable to reach out with their family members. I have this friend and she is an outpatient rehab mesa az and I’m serve as his support normie.I’am tahnkful all of his friend he is very comfortably to open woes in life. This support list is awesome. The compassion in the way it is written really touched me. Thank you so much for sharing this. Love this list! I am in the beginning stages of not drinking (just shy of one week) and am trying to decide who to tell and not to tell – ironically enough, for whatever reason, my family members are the people that I want to tell the least. Nice advice. I caved on Christmas Eve. I had two glasses of wine. I caved buying into my daughter saying “you don’t drink that much”. Anyway, unto recovery. Jean, I want to say thank you as we come to the end of 2014. I am into my second holiday season of sobriety, having stopped drinking in August 2013. I’m thanking you because it was your blog that I found first. I devoured it with such hope and anticipation that I, too, could live in freedom. Your story was so much my story. Healthy emotionally and physically, successful in my career and relationships, yet I just knew. I so wanted to make that change in my life. And indeed I have. So thank you. And a blessed upcoming year to you. Ditto the above!! I am 100 days sober today and it was your blog that I stumbled across and held onto for dear life. Thank you from the bottom of my sober heart!! Great post, thanks! I’m on my 11th day. I needed this! Thank you for the guidance – with only 90 days of sobriety, I appreciate all the help I can get! God bless you – I am really leaning on your posts! You always have excellent advice! Thank you! This looks like a thorough and comprehensive list. I still haven’t told any of my ‘real life’ people the actual reasons I’m not drinking – I blame it on stomach problems instead, which, while embarrassing, paradoxically also lets me save face. I have to admit that it is so true: our first instinct is to go the closest family member. In fact, it is my close friend who understands and supports me more than even my husband or my other friends. Thank you for a good post! I am 111 days sober. I have a wonderful non-drinking spouse, as well as lots of good normies! I am a lucky one. Wow! I have missed you! Sorry I haven’t hit sobriety yet but if you rubbed your two fingers together and listened to my calamities, you should shame on me! Seriously, things have gotten this bad. I am a sandwich. Administor for an estate. My mother, to which I am the eldest of four and have survived many years of abuse am taking care of my mother, who is now bypassing me to get to my children to do her bidding after being hospitalized. There is more. The spouse that hates a drunk and calls me a blob. (Yes, 59 pounds overweight after running over 6 miles a day) I am ashamed of myself. Gosh I ate spinach, kale and blueberries! Hopefully my Uncle’s estate will settle soon. This was a family home. He ruined it. There was mice poop everywhere! The weekend before he was hospitalized and declined I slept in my car after driving 12 hours to see him. so. Finishing many things. Alcohol too. To be so close to 50 years of age, and be accountable to so many others has not helped. Many blessings to you! Merry Christmas! Sobriety is possible! Thank-you for your wisdom Jean. I have crashed and burned 4 of the last 6 nights. I am terrified of the next week. I will print this list and there’s a person I know I can give it to. I haven’t had a way to describe what I needed before. That takes courage. It is not easy telling your friends they may need to limit your liberty to keep you from hurting yourself. It is hard to reach out. Proactive steps like this are the steps that lead to success. i’ve certainly had all of those conversations…and its not an issue any longer, but oh…for those of you new on this journey! Ahh! Food for thought. Bless you and thank you for your support. Have a wonderful Christmas.